The iconic Ringstrasse in Vienna, Austria. Photo by Christian Stemper. MAK - AUSTRIAN MUSEUM OF APPLIED ARTS/ CONTEMPORARY ARTS (Museum für angewandte Kunst/Gegenwartskunst) Style: Neo-Renaissance The concept for a Museum of Applied Arts was based on the V&A Museum in London (the two buildings look similar with their ochre brick façades). It was the first museum to be completed on the Ringstrasse and today is a centre for design and contemporary art with a stunning internal courtyard. It was originally to be housed in the never-constructed final building of the Imperial Forum, but it eventually found a home in the more suburban south-east section of the Ringstrasse. FORMER MINISTRY OF WAR (Kriegsministerium) Style: None whatsoever The former Ministry of War building was the final building completed as part of the Ringstrasse project in 1913. It is almost grotesque in its unashamedly intimidating and overbearing stance on the Ringstrasse and, truth be told, not very popular with the locals. It gives today’s visitors a window into the kind of imperial saber-rattling that led to the First World War. The mighty double-headed eagle on top of the building points to the two corners of the Habsburg Empire, east and west, and to the duality of the Austro–Hungarian Empire. VIENNA STATE OPERA (Wiener Staatsoper) Style: Neo-Renaissance The first major building of the Ringstrasse was not well received when it first opened, as it was seen as lacking in the appropriate magnificence. The façade was thankfully protected during the war but the interior had to be modernised after a fire destroyed the majority of the stage and stalls in 1944. 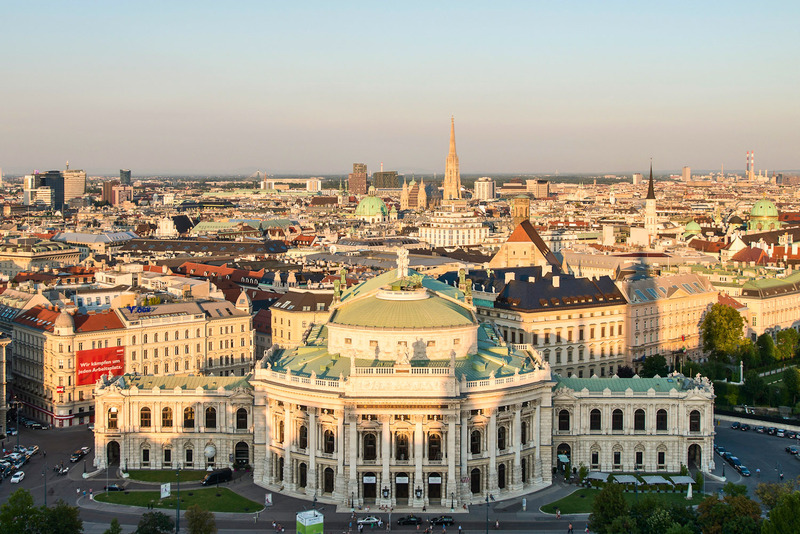 Today the State Opera is the epicentre of modern Vienna and stands as a sort of gateway to the city. The city’s most famous accommodation, Hotel Sacher, sits just behind it, as does one of Vienna’s most important museums, the Albertina. PARLIAMENT (Parlamentsgebäude) Style: Greek Revival The largest building on the Ringstrasse, the Parliament building is the most obvious expression of Historicism in Vienna. The Corinthian column façade, complete with architrave and frieze plus the resolute and daunting Pallas Athene fountain, all crafted from glistening white marble, make for an imposing structure. The Dutch born architect Theophil Hansen, who was practising in Athens at the time, took a holistic approach to the design, conceptualising everything from the building itself to the interior decorations within including sculptures and chandeliers, most of which were meticulously restored after the war. POST OFFICE SAVINGS BANK (Postsparkasse) Style: Early Modern One of the most fascinating structures on the Ringstrasse, the former Post Office Savings Bank, straddles the Historicism and Modern movement. Architect Otto Wagner was a leading thinker and proponent of the movement away from derivative architecture to the modern. This building exemplifies the divide between the two. The façade is square marble plates bolted to a brick structure then capped with aluminum. These round shiny discs are reminiscent of coins, symbolic to the purpose of the building. The top is adorned by the world’s largest aluminum statues. It's not surprising then that it has been reported that the building used a sixth of the world’s supply of aluminum at the time of construction. Wagner also designed the interiors. Today the building has a lovely small museum dedicated to his architecture. 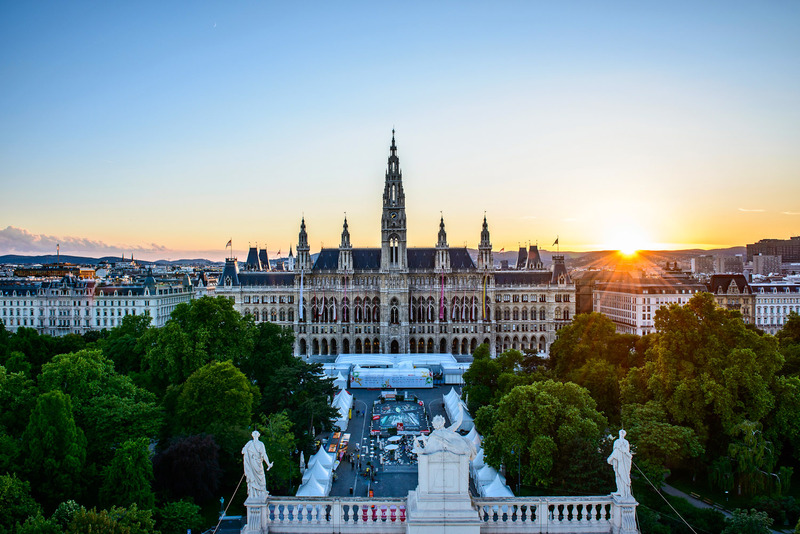 VIENNA TOWN HALL (Rathaus) Style: Neo-Gothic While Rathaus seems a rather phonetically appropriate name for the Town Hall, the cathedral-like neo-Gothic building is another hub for Viennese, with major civic events occurring in its forecourt. In summer the Life Ball, an extravagant LGBT event is a city-wide spectacle much like Sydney’s Mardi Gras, while in winter the Christmas markets here are some of the most spectacular – and crowded – in Europe. Inside it’s incredibly ornate and spacious, with a ballroom big enough to fit at least 1500 pairs of waltzers. Its outsized proportions are due to unbridled confidence: the powers that be were expecting four million people to eventually live in Vienna – only 1.7 million do today. COURT THEATRE (Burgtheater) Style: Neo-Baroque Opposite the Town Hall, the original theatre premiered three Mozart operas and Beethoven’s First Symphony. Being the Court Theatre, it was no surprise it was moved to the Ringstrasse; the new building, by the same architects as the Imperial Forum, was completed in 1888 and then extensively restored after the war. 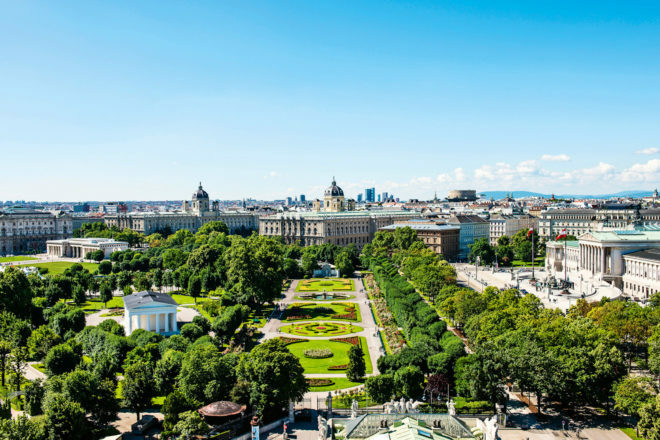 One of Europe’s most masterful boulevards, Vienna’s famed Ringstrasse celebrates a distinguished milestone this year. Here, Quentin Long strolls past some of its most imposing structures and through 150 years of compelling history. 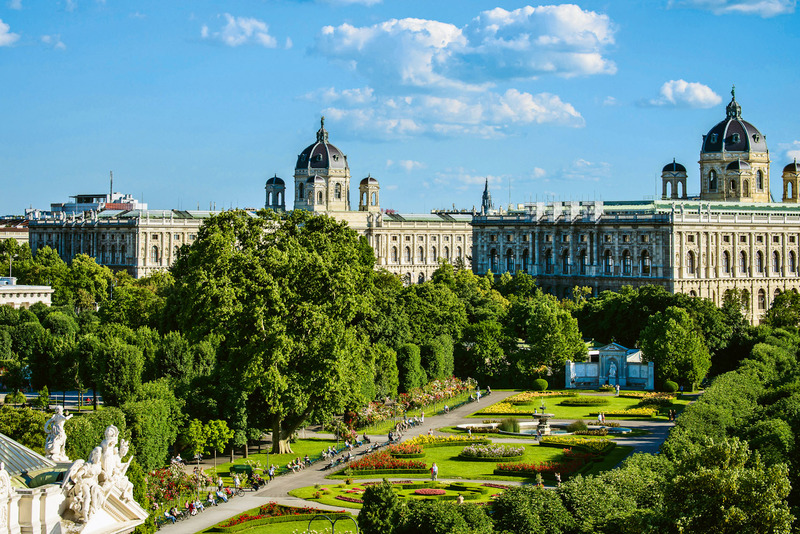 If there is one ring to rule them all, then in Europe it must be Vienna’s Ringstrasse. While many will argue that the grandeur of the Champs-Élysées can not be rivalled anywhere in the world, its hordes of tourists and crass retail make the Paris centerpiece an underwhelming experience. By contrast, the Ringstrasse has altogether more charm. A sophisticated marvel of modern civic planning, design and architecture, the Ringstrasse is unmatched in beauty and drama. 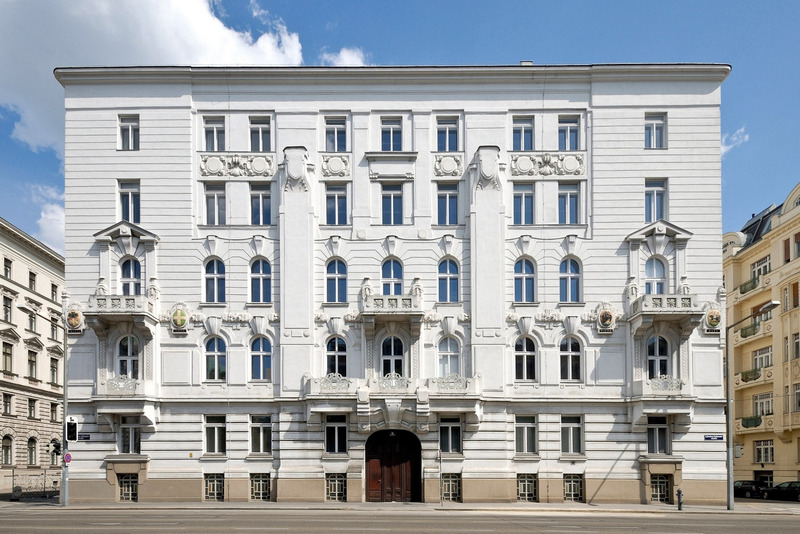 As it celebrates its 150th year, we take you on a journey past some of the majestic thoroughfare’s most interesting buildings, revealing the true extent and magnificence of Vienna’s golden age. Like most mega European cities, by the mid-19th century Vienna had outgrown its medieval walls. The population of the Habsburg’s mightiest city was booming but there was much consternation between the elite and the bourgeoisie. The swelling middle classes were demanding equal status, influence and rights to land which, up until that point, had been reserved for the aristocratic elite. The walls and the glacis, a cleared parkland deemed necessary for the protection of the city, ensured there was plenty of space between those that ruled and those that were ruled. In 1857, Franz Joseph I settled the matter by declaring “Es ist mein wille” (It is my will) for the walls to be razed and the boulevard to end all boulevards to be built to show off the might and glory of the Habsburg Empire. And so began what Viennese and Austrians refer to as the Ringstrasse Era (much like what the British would refer to as the Victorian or Edwardian eras), characterised not just by 50 years of continuous construction in Vienna but, most importantly, the ascendancy of merchants and the bourgeoisie, particularly the Jewish middle class, to their rightful place of influence amongst royalty and the aristocracy. After all, it was the middle classes’ purchase of prime land to build palaces to show off their own wealth and power on the Ringstrasse that funded the construction of the public buildings and roads. 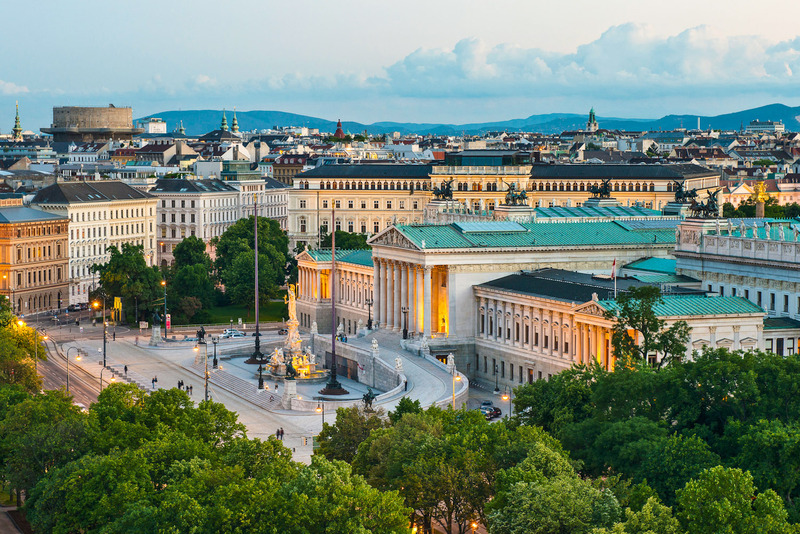 So whilst the Ringstrasse was a phenomenal example of modern town planning, resulting in an impressive, grand city promenade, it was also an important catalyst for enormous cultural change. The buildings of the Ringstrasse are an incongruous cacophony of architecture to the uninitiated, lurching from Classical to Gothic to Renaissance to Baroque in the space of a few blocks. But all of these styles form part of the Historicism movement, where the practical purpose of the building was reflected in its architectural style. To illustrate the point, take the Parliament building, which is built in the Greek Revival style as Greece is the birthplace of democracy; City Hall is neo-Gothic because of civic autonomy originating in Flanders; the State Opera is neo-Renaissance in design because of the Italian Renaissance’s role as the propagator of science and art across continental Europe. These three structures – the never completed Imperial Forum, now known as the Neue Burg, the Museum of Fine Art and The Natural History Museum – should be appreciated as one entity. Designed to rival the Louvre, a fourth structure was meant to be an identical facing wing to the Neue Burg joined by arches but as it had no purpose other than an ostentatious display of power it was replaced by Heroes Square (Heldenplatz). The buildings are dramatic and imposing, as would be expected from an Imperial Forum. Today the museums are world-class, with the Natural History Museum housing the stone-age figurine Venus of Willendorf and the largest collection of meteorites in the world. In the Museum of Fine Arts you will find many European masters works including the world’s largest Bruegel collection, Raphael’s Madonna in the Meadow, the Infanta paintings by Velazquez, plus works by Rubens, Rembrandt, Dürer, Titian and Tintoretto. A short stroll to the east of the Fine Art and Natural History museums is the Museum Quarter where the Museum of Modern Art (mumok), Leopold Museum, Architecture Centre and several other cultural institutions can be found. This is a favourite place for local Viennese to meet and drink with friends in summer, so plan your visit for the afternoon and once you have had your fill of cultural wonderment you can head to the courtyard cafés to soak up local life. The first major building of the Ringstrasse was not well received when it first opened, as it was seen as lacking in the appropriate magnificence. The façade was thankfully protected during the war but the interior had to be modernised after a fire destroyed the majority of the stage and stalls in 1944. 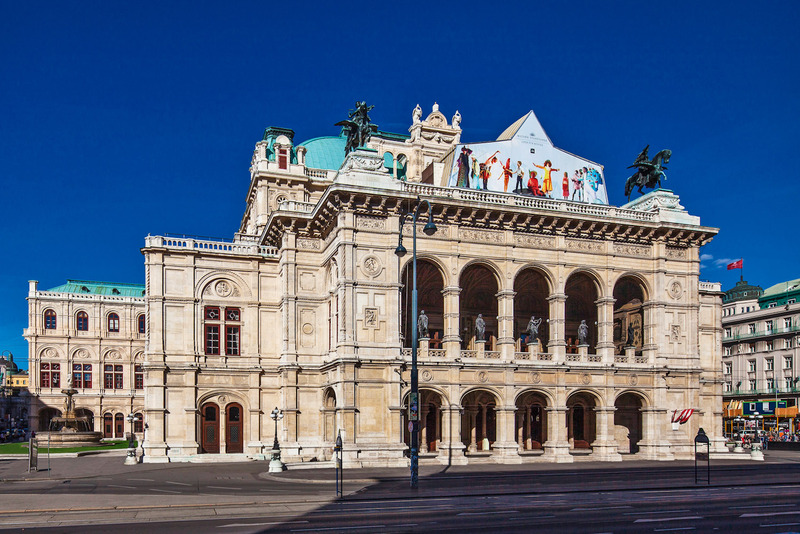 Today the State Opera is the epicentre of modern Vienna and stands as a sort of gateway to the city. The city’s most famous accommodation, Hotel Sacher, sits just behind it, as does one of Vienna’s most important museums, the Albertina. 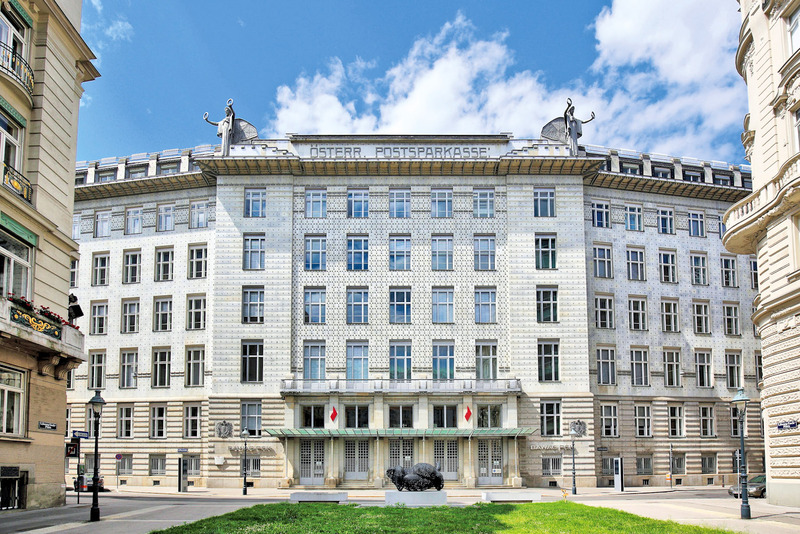 The former Ministry of War building was the final building completed as part of the Ringstrasse project in 1913. It is almost grotesque in its unashamedly intimidating and overbearing stance on the Ringstrasse and, truth be told, not very popular with the locals. It gives today’s visitors a window into the kind of imperial saber-rattling that led to the First World War. The mighty double-headed eagle on top of the building points to the two corners of the Habsburg Empire, east and west, and to the duality of the Austro–Hungarian Empire. Opposite the Town Hall, the original theatre premiered three Mozart operas and Beethoven’s First Symphony. Being the Court Theatre, it was no surprise it was moved to the Ringstrasse; the new building, by the same architects as the Imperial Forum, was completed in 1888 and then extensively restored after the war. One of the most fascinating structures on the Ringstrasse, the former Post Office Savings Bank, straddles the Historicism and Modern movement. Architect Otto Wagner was a leading thinker and proponent of the movement away from derivative architecture to the modern. This building exemplifies the divide between the two. The façade is square marble plates bolted to a brick structure then capped with aluminum. These round shiny discs are reminiscent of coins, symbolic to the purpose of the building. The top is adorned by the world’s largest aluminum statues. It’s not surprising then that it has been reported that the building used a sixth of the world’s supply of aluminum at the time of construction. Wagner also designed the interiors. 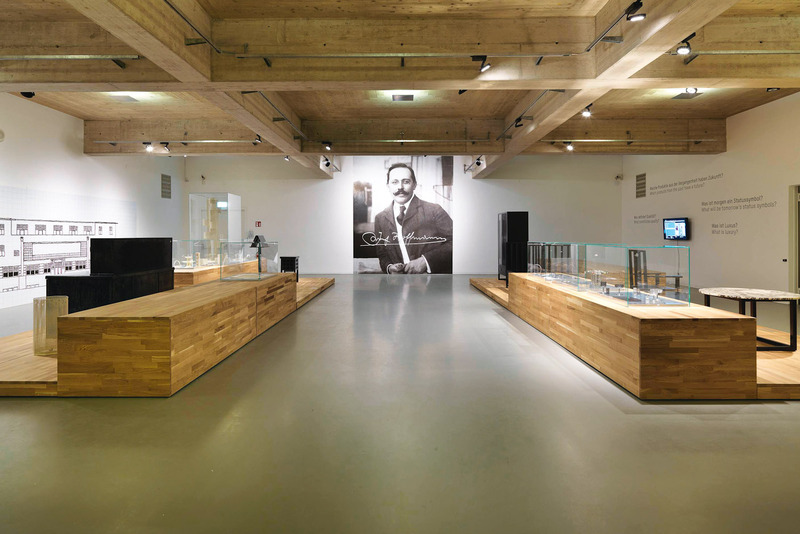 Today the building has a lovely small museum dedicated to his architecture. The Ephrussi Palace recently gained some attention with the release of Edmund de Waal’s family memoir, The Hare with Amber Eyes, which shows a darker side to the Ringstrasse. Remembering that its construction was largely funded by the sale of land to wealthy Jewish families (only granted the right to buy property by Franz Joseph in 1867), it is shattering to realise that these same families, including the Ephrussis, lost everything under the anti-Semitic Nazi regime. Hitler, who is said to have been fascinated by the Ringstrasse, returned to Vienna in 1938 to adoring crowds, triumphantly marching along the boulevard he loved so much, and declaring the city a jewel in the crown of the Third Reich from the balcony of Neue Burg. The largest building on the Ringstrasse, the Parliament building is the most obvious expression of Historicism in Vienna. The Corinthian column façade, complete with architrave and frieze plus the resolute and daunting Pallas Athene fountain, all crafted from glistening white marble, make for an imposing structure. The Dutch born architect Theophil Hansen, who was practising in Athens at the time, took a holistic approach to the design, conceptualising everything from the building itself to the interior decorations within including sculptures and chandeliers, most of which were meticulously restored after the war. While Rathaus seems a rather phonetically appropriate name for the Town Hall, the cathedral-like neo-Gothic building is another hub for Viennese, with major civic events occurring in its forecourt. In summer the Life Ball, an extravagant LGBT event is a city-wide spectacle much like Sydney’s Mardi Gras, while in winter the Christmas markets here are some of the most spectacular – and crowded – in Europe. Inside it’s incredibly ornate and spacious, with a ballroom big enough to fit at least 1500 pairs of waltzers. Its outsized proportions are due to unbridled confidence: the powers that be were expecting four million people to eventually live in Vienna – only 1.7 million do today. The concept for a Museum of Applied Arts was based on the V&A Museum in London (the two buildings look similar with their ochre brick façades). It was the first museum to be completed on the Ringstrasse and today is a centre for design and contemporary art with a stunning internal courtyard. It was originally to be housed in the never-constructed final building of the Imperial Forum, but it eventually found a home in the more suburban south-east section of the Ringstrasse. Emirates operates daily flights to Vienna (via Dubai) from Sydney, Melbourne, Brisbane, Adelaide and Perth. Hotel Sans Souci is located just outside of the Ringstrasse in the charming arts district of Spittelberg. Located in an 1872 building, the contemporary hotel was designed by Philippe Starck’s YOO design firm and has 63 rooms, a day spa, pool, restaurant and cocktail bar. Located in the Goldenes Quartier shopping zone, just a walk from the Ringstrasse, the newly opened Park Hyatt is an ultra-luxe option housed in a century-old bank, which has inspired its ornate gold theme. It has 143 guest rooms, a day spa, whisky and cigar bar, a fine dining restaurant and a lobby lounge, and a swimming pool which occupies the former vault space. Vienna is celebrating 150 years of the Ringstrasse in 2015, with several events taking place throughout the year. See wien.info/en/sightseeing/ringstrasse2015 for more information.